These are some fingerless gloves I designed and I am so happy they are done! 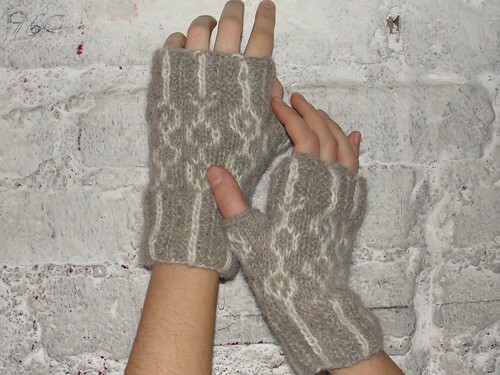 They are made with brushed suri and are so so warm! I was able to make the first one so quickly but kept having all this drama with the second one (needles falling out, having to re-start so many times) but once I sat down and focused on it, it took no time at all. You can totally learn to knit = it just takes a little patience. Good luck!! These look so cool! The yarn looks super warm and soft. The colors that you chose look very nice together. thank you soshespeaks and anneadeline!! If you do branch from your crochet tree soshespeaks I want to see! Cute! I've been trying to think of something to do with the suri in my stash, so this might have to go on my to-do list.